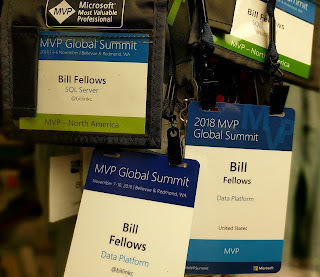 Another year of the MVP Summit is in the bag and as always, I have months worth of learning I'm excited to do. I'd like to extend a hearty thank you to Microsoft and the various teams for hosting us. I can't imagine the sheer amount of hours spent in preparation, actual time not-spent-working-on-technology-X, much less the expense of caffeinating, feeding, lodging, and transporting us. We have a high performance (60M messages per day averaging 130ms throughput) messaging system that allows us to expose mainframe data as a SQL Server database for analytics. The devil with Service Broker is that there's no built in monitoring. We have a clever dashboard built on the PowerBI reporting streaming dataset source that provides an at-a-glance health check for data processing. What we need though, is something that can drive action based on changes. The September changes in Stream Analytics look like the perfect fit. It allows us to detect not just hard limits (we've violated our 3 second SLA) but the squishier metrics like a background process just woke up and swamped us with a million rows in the past three minutes or our processing time is trending upwards and someone needs to figure out why. While we are not yet using graph features, I can see opportunities for it with our client that I want to build some proof of concept models. Alongside the Stream Analytics improvements, perhaps we need to feed the change data into Cosmos and then leverage the Change Feed support to push to analytics processing. And just generally, I need to invest some time in Apache Spark. I also learned that I don't need to discover all the patterns for lambda architecture as it's already out there with a handy URL to boot. Ok, while picking up information about this was just to scratch a very silly itch, I was impressed how easy it was from the web interface. I have bird feeders and even though most seed will state that squirrels are not interested in it, that's a downright lie. I want a camera pointed at my bird feeder and if a squirrel shows, I want to know about it. I used about a dozen pictures of my bird feeders with and without my nemesis to train the model and then fed back assorted photos to see how smart it was. Except for an image of a squirrel hiding in shadow, it was able to give me high confidence readings on what was featured in the photo. 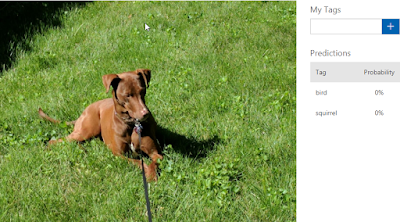 Here we can see that my dog is neither a bird nor a squirrel. This is the new cross platform SQL Server Management Studio replacement - sort of. It's not designed to do everything SSMS does but instead the vision is to solve the most needed problems and with the open source model, the community can patch in their own solutions. I'm excited to put together a better reporting interface for the SSISDB. Something that you can actually copy text out of - how crazy is that? It had been a year since I had worked through some of the ADLA/USQL so it was good to get back into the language and environment. I need to get on a project that is actually using the technology though to really cement my knowledge. In October of 2016, I launched Sterling Data Consulting as my company. I sub under a good friend and it's been an adventure running a business but I don't feel like I'm really running a business since I have no other business. One of my TODOs at the conference was to talk to other small shop owners to see if I could discover their "secret sauce." While I got assorted feedback, the two I want to send a special thank you to are John Sterrett of Procure SQL and Tim Radney. Their advice ranged from straight forward "I don't know what you do", "are you for hire" to thoughts on lead acquisition and my lack of vision for sales. Tim was also my roommate and it was great just getting to know him. We traded Boy Scout leader stories and he had excellent ideas for High Adventure fundraisers since that's something our troop is looking to do next year. For being a year younger than me, he sure had a lot more wisdom on the things I don't do or don't do well. You should check him at at the Atlanta SQL Saturday and attend his precon on Common SQL Server mistakes and how to avoid them. Bellevue is less scenic than Seattle but the sunshine and warmth on Tuesday made for some nice photos of the treehouses. Yes, the Microsoft Campus has adult sized treehouses in it. How cool is that?